Are You a Fan of Alice too? I LOVE Alice books and read anything based on Wonderland. Right now The Philie library at rosenbach.org is celebrating 150 years of Alice. If you are lucky enough to live in or near Philie the original manuscript is on display Oct 14 - 18. I'm on the other side of the state so it's a no go for me. If you are looking for free e-books of the Lewis Carroll stories go to http://www.gutenberg.org They even have a file of drawings. LOVE Gutenburg for old books! The picture above is for an 'Alice in Wonderland' series I recently read. It's set a YA series and is set now. The difference is that it's about Alice's descendants and is a bit dark. That makes it different from any other Alice book I've read. Here's a link to the writer's blog. I love the cover of the first book! I got it at my local library and the colors are beautiful. Barnes and Noble and Amazon have some free e-books with reference to Alice. I have a nook so I go to B&N. There's the Kingdom series by Marie Hall. 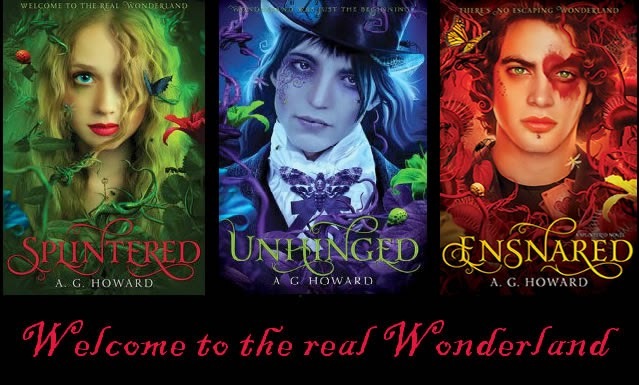 There's a Wonderland story with quite a twist. A crazy mad hatter is searching for an Alice and finds his match in one from Hawaii. Definitely different love story. I just DL Insanity (Mad in Wonderland) by Cameron Jace so I don't know what it's about yet or if it's any good. Oh, and if you wonder about the riddle, why is a raven like a writing desk? Here's what I found while researching.